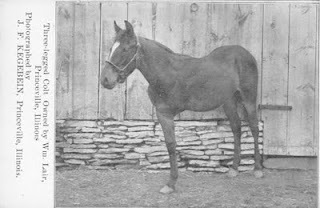 I would imagine he didn't get the family to town very quickly, but the three-legged colt belonging to William Lair, of Princeville, Illinois must certainly have caused quite a stir in the small town. I wasn't terribly surprised to find this postcard in a large and dusty collection of old postcards kept over the years by my great-grandmother's family, but what did surprise me was finding two other copies of it on eBay! William Lair was the younger brother of my gr-gr-gr grandfather, Lawson Lair. William spent the bulk of his life in the Princeville area, working as a farmhand until his enlistment in the Civil War. Described as nearly 6'2", with dark hair and gray eyes, he and twelve of his comrades were known as the "Lucky Thirteen" - all local boys who fought in the war and returned to their homes and families; William had served three years, and then re-enlisted as a veteran. After his return to Princeville, he married Susan Hammer Givens, a widow with a young daughter. In addition to this girl, he and Susan took in a boy in need of a home. Despite being one of the "Lucky Thirteen," William was not quite as "lucky" as the name implies. His health suffered greatly from his years of service in harsh conditions, often spending days at a time in dark, cold marshes, breathing less than the purest of air. William's lungs were never the same after his service, and this "lung disease" eventually took his life twelve years after his military discharge, at the young age of 35. I have often wondered what became of this "famous" three-legged horse, and why so many pictures of it have survived the ~140 years since this photo was taken. George MacConnachie will never have a descendant to memorialize him, but no history of our Joyce clan would be complete without his inclusion. Stories at the last Joyce family reunion often included his name - sometimes a jovial story of drinking whiskey on the front porch with the Joyce men, other more somber times when he was present in a more official capacity. 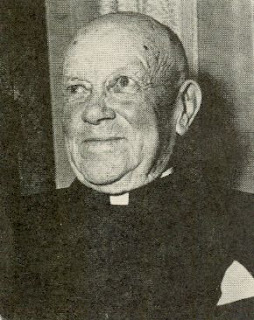 Father George MacConnachie came to the plains of eastern South Dakota on Oct. 1, 1900, assigned to St. Bernard's Catholic Church at Redfield. He was just 25 years old. He had been ordained in Spain the year prior, and with his parents in Scotland both being deceased, he put his life and soul into the pioneers on the prairie. The Michael Joyce family came to South Dakota in 1884, having slowly made their way inland after immigrating from Ireland some 40 years prior. Mike Joyce died in 1914; while his obituary does not mention who officiated at the service, I have no doubt it was Father MacConnachie. 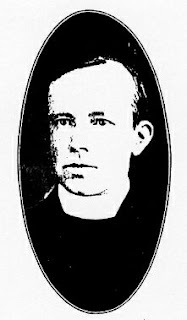 When Mrs. Joyce died in 1924, it was Father MacConnachie who presided over her last service, and comforted her family. As the grandchildren married, it was Father MacConnachie who joined them in holy matrimony. As they died, it was Father who preached the last sad sermon for them. He baptized their children, and comforted them in times of illnesses and death. He also enjoyed a relationship of friendship with the Joyces. Father MacConnachie loved to fish and hunt; and like the Joyces, he had a sense of humor and a gift as a storyteller that made him a most enjoyable conversationalist. He made many visits to the various Joyce ho mesteads in Spink and northern Hand counties. But Father George MacConnachie's firm dedication to his life's work and the God he served was always his foremost priority. In his years at St. Bernard's, he erected the parish house, and every rock in the church was blasted by him. In his first 15 years at the church, he never missed a service. He celebrated his Diamond Jubilee at St. Bernard's in 1959, and died four years later in Pierre, South Dakota, at the age of 87. He was buried in the cemetery at Redfield, among the families he served for so many years. He will forever be a part of our family memories and stories, and judging by the stories I've heard, I suspect he is an important part of many other families' legacies as well.